Kids love The Petunia Patch, Sweet Pea, and Martha’s Vineyard and here’s why! The Petunia Patch is only a five minute walk from your choice of three ice cream parlors, including Ben and Bill’s Chocolate Emporium, Carousel Ice Cream, and Mad Martha’s! Each is delicious in its own way so you’ll have to try each one yourself to decide which is best! Feeling especially daring? 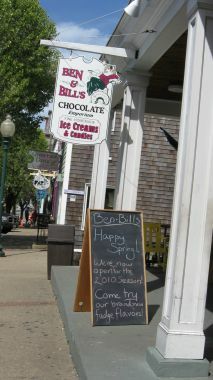 Try out Ben and Bill’s famous lobster ice cream! Who doesn’t love nachos, quesadillas, and tacos? Sharky’s Cantina is another kid favorite and Mom and Dad will be happy with the margaritas (try the watermelon!). A more upscale Mexican dining experience can be had at Zapotec restaurant. The town’s tennis courts, basketball court, and playground are only a 5 minute walk from the Petunia Patch. Be sure to bring your tennis rackets and sneakers if you love to play! enjoy the ocean views. The gazebo in Ocean Park serves as a bandstand for the Vineyard Haven Band, which gives a concert every other Sunday night in the summer months. Families spread blankets on the lawn and listen to spirited band music while enjoying a picnic dinner. It’s a Vineyard tradition for kids of all ages to march around the bandstand with the music! Do you love pizza? Giordano’s in Oak Bluffs is as much as a Vineyard pastime as it is a Vineyard landmark. Grab a slice at the pizza window or some fried clams from the seafood window! You can also enjoy indoor seating and a delicious Italian meal in what is probably the most kid-friendly restaurant in Oak Bluffs. There’s something magical about the Flying Horses Carousel in Oak Bluffs, which is only a short walk from The Petunia Patch. There are big horses on the outside for the older kids, and small horses on the inside for the rookies. While riding the oldest working carousel in the U.S., try your luck at catching the brass ring, and win yourself a free ride! 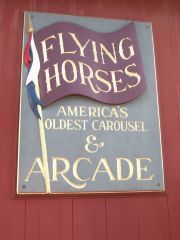 The Flying Horses is one of the few carousels in the country that still has a ring machine, and both inside and outside passengers can reach out and catch rings while traveling around. Most riders only catch one ring per pass, but the more experienced riders can catch 2, 3, 4 or even 5 rings at a time! Go ahead, give it a whirl! Do your kids love video games? Do you have a love for classic arcade games that you never seemed to outgrow? Walk into town and visit The Game Room on Circuit Avenue in Oak Bluffs. The Game Room is a family entertainment center that features over 75 arcade and skill games. Be sure to collect tickets that can be redeemed for prizes!